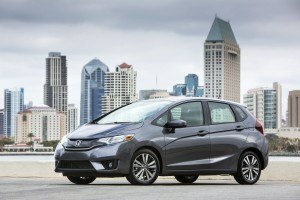 The Honda Fit has quickly become one of the top choices for fans of the subcompact car market, and continues to grow in popularity. A gently used 2016 Honda Fit is no different, bringing an array of advancements and technological accomplishments to an automotive class that is constantly growing. The 2016 Fit is small and sporty, but has enough interior space to comfortably fit five, or fold down the seats completely to create more cabin space than any comparable vehicle. The 2016 Honda Fit used has a fuel economy unlike others, with 8.1L/100km city and 6.4L/100km on the highway. A preowned Honda Fit brings with it standard anti-lock brakes, traction control, and the addition of a blind spot system on some models adds to the increased safety. The reviews are in, if you’re looking for a fun, fuel efficient ride, a used 2016 Honda Fit is exactly what you’re looking for. We are actively attempting to source used 2016 Honda Fit models. Please fill out the form below and we will find one for you.